Ruckus the Eskie: Almost Blinded in the Night! I thought it would be more appropriate to post it this Monday Mischief. Have you noticed it in my most recent photos and videos? It broke my heart to see Saturday Pet Blogger Hop come to an end so abruptly. In their honor, I decided to add a new twist for all you Saturday Hoppers. 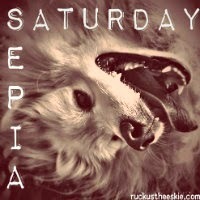 I would love for you join me by hopping onto Sepia Saturday! I figure I love modeling and my sapiens love photography...so let's see what creative experiences we can all display! Saturday hop sounds fun. What happened to Ruckus's face? Thanks SlimDoggy. I ran into something in the dark in my friend's backyard. I can't really tell you what it was ...even to this day...it remains a mystery to all of us. I am just so thankful that it was not any higher because I would have really injured my eye. Oh no your poor face. The Saturday hop sounds fun. Unfortunately due to my schedule I can't hop on Saturdays or Sundays. Best of luck with it. Oooo, that's a little too close to the eye. Ouch. That sounds like a fun Saturday hop. Awesome about the sepia hop!!!! I really like hopping on Saturday. And I'm glad that it won't just be pets. I can hop from either of my blogs! Thanks! Yikes! We are glad that it missed your eye and we hope you heal up quick! oh no you poor baby! Hoping you are ok! Heal fast, Ruckus! It would happen on Friday the 13th. Bad luck! Oh, poor sweetie! I bet your peeps have given you lots of kisses to make it all better! Hope that is helping! Be careful out there! Hope you're healing okay! Love the idea of the Sepia hop, I'll try to remember to join in sometime, it sounds like fun! I hope that heals quickly!